It’s not easy to find markets for your produce when you’re an immigrant farmer or someone new to farming. You can sell your crops at fruit stands or farmers markets, but you may not have the contacts or even the language skills and cultural customs to connect with large-scale produce distributors. Meanwhile, in restaurants, grocery stores, schools, hospitals and corporate lunchrooms across the state, buyers are clamoring for locally grown food. But that’s changing, thanks to a new Small and Ethnic Farmer Market Tour Project which introduces small farmers to conventional distributors interested in offering a line of locally grown food. The project is run by the UC Sustainable Agriculture Research and Education Program (SAREP) and funded by CoBank, Farm Credit West, American AgCredit, and newly added Fresno-Madera Farm Credit along with Farm Credit Services of Colusa-Glenn. The tours work like this: Farm advisors and Cooperative Extension specialists identify the small, specialty-crop growers in their areas, many of whom are Hmong, Mien and Latino. The growers climb aboard a bus along with tour leaders like Feenstra and David Visher, an analyst with UC SAREP. SAREP hosted two successful tours in fall, 2013 to a group of 46 farmers who grow fruits, vegetables, flowers, and field crops. Tour participants spoke English, Chinese, and Spanish, and translators worked for 15 hours to ensure that each participant understood all the information shared. Farmers were able to learn about purchasing criteria from a number of different buyers and establish contacts with them. The success of the tours was evident in the weeks to follow. Several farmers reported back that they connected directly with produce buyers and even sold much of their upcoming harvests as a result of the contacts made. In thank you notes following the tour, farmers gave overwhelmingly positive feedback to the tours. Over half of the tour’s participants have since signed up for individual consultations with Visher to continue to refine their marketing strategies. The consultations help farmers create an action plan for selling their crops and prepare a farm profile — a flyer that explains who they are and what they grow. Following the tours, each produce buyer requested contact information for the full list of grower participants, opening doors for those conversations to develop into business relationships. CoBank and the Farm Credit partners say they are happy to help. In response to the success of the 2013 tours, Fresno-Madera Farm Credit has joined with CoBank, Farm Credit West, American AgCredit, and Farm Credit Services of Colusa-Glenn —to expand the workshops to other regions of California. 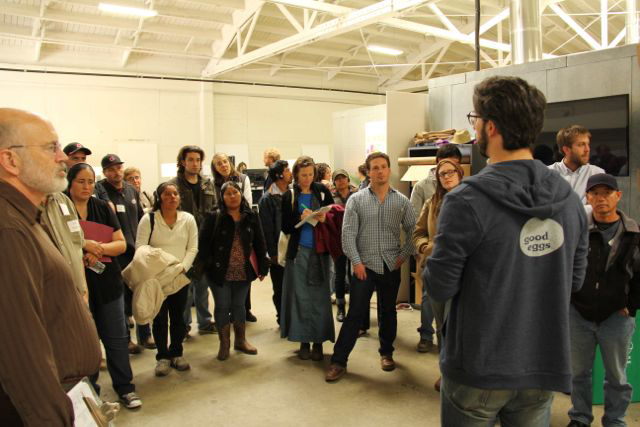 The tours, dubbed “workshops on wheels” by many social media users, received excellent press coverage including a front page article in the San Francisco Chronicle, the Daily Democrat, Capital Press, AgAlert, Valley Public Radio, Farms Reach, the California Farm Bureau Newsletter, and a news segment by Fox 40 in Sacramento.